River cruise specialist, AmaWaterways, is the latest major industry player to become part of the extensive travel technology specialists's network. Users of Traveltek's market-leading booking platform will soon have the opportunity to access and make live bookings for AmaWaterways' extensive selection of river cruises. 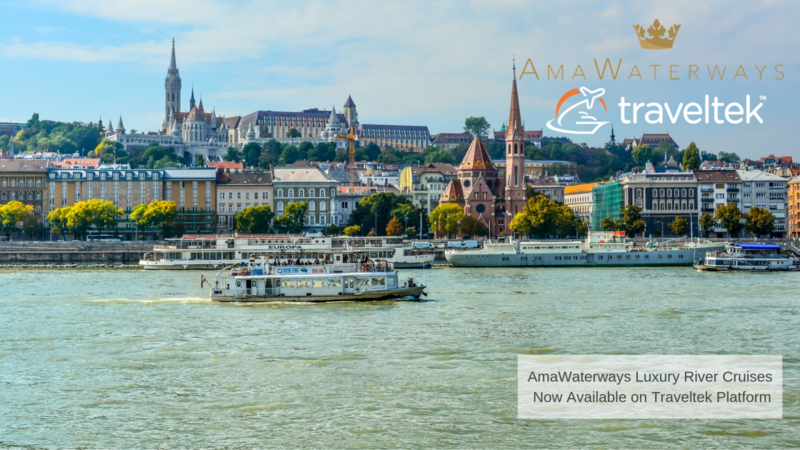 Thanks to the increased interest that river cruise has enjoyed in recent years, the addition of AmaWaterways itineraries to the Traveltek platform is sure to be well received by the company's global client base. As a leader in the field, AmaWaterways boasts the "Highest Rated Fleet in Europe" as noted in Berlitz Guide to River Cruising and is very well known for its award-winning cuisine, personalised service and custom designed ships. AmaWaterways consistently strives ahead with a wide choice of excursions, including active discovery hiking and biking tours as well as an onboard Wellness Programme with Wellness Hosts. The cruise specialist offers a range of carefully crafted itineraries onboard their extensive fleet on rivers throughout Europe, Africa, Vietnam and Cambodia. Commenting on the union, AmaWaterways' Sales, Marketing and Digital Director, Jamie Loizou, said "We're delighted to be working with Traveltek. This relationship enables us to build upon our trade focus by providing even more of our travel partners with our content to support them in promoting and selling AmaWaterways and river cruising." Traveltek's CCO, Cressida Sergeant, commented: "Here at Traveltek our mission is to connect the industry's largest community of buyers and sellers worldwide, so it makes perfect business sense to partner with such a prestigious cruise operator. "Additionally, with river cruising enjoying double digit growth year on year, it's important that our platform is well equipped to deal with the demand. Integrating a company who was recognised as the 'TTG River Cruise Line of the Year 2018' at the recent Travel Awards is a very strong addition to our growing network. We're delighted to be working with AmaWaterways at this very exciting time." Traveltek's Head of Sales in the UK & MENA, Neil Welsh, added, "I foresee a really positive response to this partnership. We're allowing our clients to diversify their own portfolio and do business with river cruise lines when their products and services are in extremely high demand. Using the most advanced technology on the market, with integrations such as this one, helps our clients remain at the forefront of what is a fiercely competitive market."